Start off your visit on the 5th (Mon): enjoy the sand and surf at Seventy-Five Mile Beach and then take a peaceful walk through Central Station Rainforest. Keep things going the next day: kick back and relax at Eli Creek, contemplate the waterfront views at Boomanjin lake, and then explore the activities along Lake McKenzie. 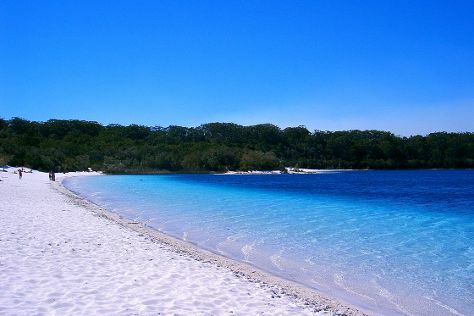 Plan my trip to Fraser Island with suggested itineraries provided by Inspirock. Hervey Bay to Fraser Island is an approximately 4.5-hour combination of car and ferry. In August in Fraser Island, expect temperatures between 27°C during the day and 13°C at night. Cap off your sightseeing on the 7th (Wed) early enough to travel to Hervey Bay. On the 7th (Wed), cool off at WetSide Water Park, then get up close to creatures of the deep with a dolphin and whale watching tour, and then make a trip to The Pier. To find ratings, photos, reviews, and other tourist information, refer to the Hervey Bay trip planning site . You can do a combination of car and ferry from Fraser Island to Hervey Bay in 4.5 hours. August in Hervey Bay sees daily highs of 27°C and lows of 13°C at night. Finish your sightseeing early on the 7th (Wed) to allow enough time to travel to Rockhampton. 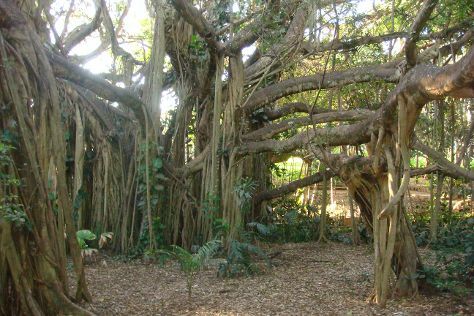 On the 8th (Thu), identify plant and animal life at Capricorn Caves, take an in-depth tour of Rockhampton Heritage Village, then admire the natural beauty at Kershaw Gardens, and finally tour the pleasant surroundings at Rockhampton Botanic Gardens. For ratings, where to stay, and other tourist information, you can read our Rockhampton route planner. You can take a train from Hervey Bay to Rockhampton in 4.5 hours. Other options are to fly; or drive. In August in Rockhampton, expect temperatures between 30°C during the day and 13°C at night. Finish your sightseeing early on the 9th (Fri) so you can travel to Airlie Beach. Explore the numerous day-trip ideas around Airlie Beach: Bowen (The Big Mango & Horseshoe Bay). Spend the 10th (Sat) among aquatic life with a scuba or snorkeling tour. On the 11th (Sun), spend a thrilling day on the water with a speed boat tour. There's lots more to do: get some thrills out on the water with a waterskiing or jet-skiing adventure, soothe aching muscles at some of the top local wellness centers, go for a walk through Coral Beach and the Beak, Conway National Park, and tour the pleasant surroundings at Whitehaven Beach. To find ratings, photos, reviews, and other tourist information, refer to the Airlie Beach trip itinerary maker app . Getting from Rockhampton to Airlie Beach by combination of flight and bus takes about 5.5 hours. Other options: drive; or take a bus. When traveling from Rockhampton in August, plan for little chillier days in Airlie Beach, with highs around 26°C, while nights are a bit warmer with lows around 21°C. Finish up your sightseeing early on the 14th (Wed) so you can catcht the bus to Townsville. To find where to stay, traveler tips, and other tourist information, read Townsville vacation website . Getting from Airlie Beach to Townsville by bus takes about 4 hours. Other options: drive; or do a combination of bus and train. When traveling from Airlie Beach in August, plan for a bit warmer days and little chillier nights in Townsville: temperatures range from 30°C by day to 17°C at night. You'll have a few hours on the 15th (Thu) to wrap things up before traveling to Cairns. Change things up with these side-trips from Cairns: Palm Cove (Hartley's Crocodile Adventures & Spas & Wellness) and Safaris (in Port Douglas). Spend the 16th (Fri) among aquatic life with a scuba or snorkeling tour. Next up on the itinerary: hike along Esplanade Boardwalk and take in nature's colorful creations at Munro Martin Parklands. Fly from Townsville to Cairns in 3.5 hours. Alternatively, you can drive; or take a bus. In August in Cairns, expect temperatures between 31°C during the day and 20°C at night. You will have some time to spend on the 19th (Mon) before leaving for home.